It’s time to introduce you one of the most controversial international bookmakers from the industry. BetCRIS is one of the first to provide online gambling opportunities to the open public. The bookmaker is found in 1985 in San Jose, Costa Rica and nowadays their headquarters are still there. The company provides sports betting, casino games and bingo mostly for customers in South America. BetCRIS has satellite offices in many countries such as Mexico, Argentina, Brazil, Dominican Republic, Panama, Venezuela and Spain. The history of this online bookie is quite colourful. In 2003, BetCRIS had its online platform offline for more than a month, when the bookie is a victim of extortion and a series of attacks. Rumor has it that competitors are responsible for these attacks. In 2006, the bookmaker took a bold step and offered bets on a hurricane to hit the US mainland. In the same year, BetCRIS proposed a wager on Fidel Castro’s death. Apart of this, the bookie is experienced and professional sports betting provider with the great reputation among the professional gamblers. 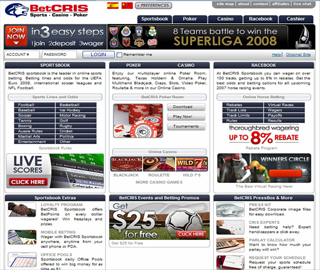 Betcris is also rated as A+ bookmaker by many experts and critics. It’s financially stable institution and without any doubt a fine choice for recreational players. BetCRIS offers a well designed sportsbook with all of the most popular events included every day. There is a wide selection of sports and many other markets, such as financials, politics and entertainment. From time to time, there are even more exotic betting opportunities, as we’ve mentioned above. The platform is convenient and perfectly smooth to navigate. All the betting options and choices are easily accessible. One of the greatest things about this bookie is that BetCRIS is very open to their customers. Whenever you feel that any sport or event should be included, you can simply message them. They may consider your suggestion and eventually add it. Most of the markets are available for live betting on a daily basis and players can wager freely on both their mobile devices and desktops. Live streaming of sports events is not supported at this time. Unfortunately, BetCRIS does not offer casino games and poker at this time. Let’s look at the one of the most important aspects for every bookmaker – the odds. As an online bookmaker of highest rank, the Betcris provides exceptional odds for some of the offered markets. The finest deals can be found in tennis, handball, ice hockey and football, so make sure to focus on these sports. The odds are placed several days (more than 3 in almost every case) before the event, however, the formatting is only American, which could be a problem for new gamblers. Bets can be placed from $1 to the various limit, which is usually related to the sport itself. Football betting has some of the popular options available. There are the standard 1X2, Double Chance, Draw No Bet, Handicaps, Correct Score and some other. However, BetCRIS mainly dedicated to sports popular in America rather than European sports and this trend surely reflect on their sportsbook. The bookie offers Straight bets and Parlays (Multi) for those who like to make complicated bets. The thing is that BetCRIS will disappoint you, if you are looking for the traditional “European” betting system. BetCRIS constantly ensures its customers that it’s employing the finest security technology in their favour. All the delicate information is stored on protected servers, which are constantly under supervision. In addition, the company guarantees that a brand new tech is guarding them against DDoS attacks. The bookie keeps complete records of any activity on their servers for up to 90 days and can easily review a certain case. The online bookmaker is also well regulated by one of strictest authorities – Costa Rica. Sometimes problems cannot be avoided, and it comes with the customer support. The BetCRIS’ representatives can be reached out by phone, livechat and email. The average time for the reply to their email is extremely low – under one hour, which we declare a record. Up to five different languages are supported, and you can always review them in the table. Money transactions can be made through various payment methods, which BetCRIS offers to their clients. It isn’t surprising that the bookie has a well-developed infrastructure when it comes to deposits and withdraws. After all the vast experience of this bookmaker is certainly in favour to their clients. All the payment options can be easily reviewed in the table. According to BetCRIS, additional fees are not applied on their side. Most deposit and withdrawals are processed in the same day with the exception of bank wire transfers, Western Union and checks. The minimum amounts can vary from $1 to $100 for the different methods. Limits are also set on most of the transaction options – usually in the range of $1000 to $10 000. The online bookie also offers the usage of Bitcoins for both deposits and withdraws. Every new player has the exciting chance to get up to $500 bonus or 15% sign up Bonus awarded as a free play. Reload bonuses comply with a 5-time rollover requirement before any withdrawal is made and the type of bonus is free play. Take note that deposits over $300 may have their charges refunded and Skrill deposits do not participate in this promotion. BetCRIS also sponsors players who decide to reload their accounts with additional funds. The requirements are almost the same as the deposit bonus rules. The only difference is the bonus percent, which is 10, and the rollover rule that is lowered one time. The bookie also employs an incredible loyalty program for dedicated gamblers called “BetPoints”. Players can accumulate valuable BetPoints and exchange them for various rewards, such as cash prizes, items and many others. Also, there are levels involved that earn the VIP clients numerous benefits on their accounts.